food travel life: Hey Guac, where's your avo? Guacamole – defined as ‘a dish of mashed avocado mixed with chopped onion, tomatoes, chili peppers, and seasoning’. Sounds pretty good to me. Search for guacamole recipes and you will find hundreds of slightly varying takes on this classic dip. But at the crux of the matter, avocado is the star of the show. Whether you mash it completely to a smooth spread, or leave it almost untouched for an incredibly satisfying chunky topping, avocado makes guacamole. 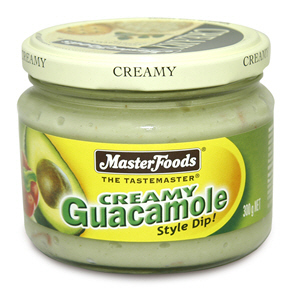 So tell me then, how can MasterFoods sell a product called ‘Creamy Guacamole’ whilst using only 1% avocado in their mix? Let’s set aside that fact, for now at least, that they have used thickener, yeast extract, citric acid, lactic acid, xanthan, flavours and colour. On their website, MasterFoods describes their guacamole as ‘a smooth and creamy blend of tasty avocados, fresh capsicums, garlic & fragrant spices’. 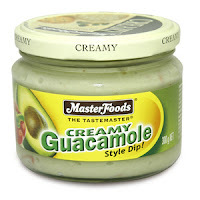 Using this same description, here is what is actually going on in MasterFoods ‘Creamy Guacamole’…‘a smooth and creamy blend of tasty water, fresh onion, garlic and sugar’. Not so appetizing any more, maybe? I’m not out to get MasterFoods or any other particular brand. This is just one example I have found of a company making money on a product that is pretending to be something it isn’t. And there will be many many more out there doing the exact same thing. Keep your eyes open and avoid checking the ‘nutritional information’ to decide whether something is healthy or not…look at the ingredient list and see what you’re feeding yourself. [One final note: I am a ‘whole foods’ kind of girl, if you hadn’t figured that out…but I’m by no means strict to the point of annoying. I like to make things from scratch and eat a good healthy diet…but when Kapiti Ice Creams, Cadbury Mousse chocolate (and other such store-bought delicacies) are provided, there ain’t no way on God’s good earth that I’m not eating that all up]. Love your food revelations Jo! Keep it up! They do that in the states too and it's sold with the sour cream. ??? I call it poor man's guac (avocados can be very expensive). A traditional Mexican way of making it while stretching the amount of avocado is to chop tomatoes, onions, cilantro (coriander) and jalapenos (de-seed to make it milder) and mix it with the avo's. For spices, I use Guajillo chile powder (any chile powder will do), salt, and lime juice. That's it. Without the avo's and chile powder, it's called "Pico de Gallo" (Americans confusingly call it "salsa").